Running to Stand Still: Running early Mornings, Nights, in Dallas & in MUD! Running early Mornings, Nights, in Dallas & in MUD! I know, every time I start out, I say the same thing.. been busy... blah, blah, blah. Well, it is the truth. I have kept up with my training, even if it means getting up at 5:00am, and running before I go to work. I missed the Philadelphia Distance Run, because my job had me in Dallas, for a conference. I did pack my running gear, and I was able to do an early Saturday morning 5.6 mile run there. Where the conference was, it was close to Dealy Plaza, so I made sure the route I planned had me running there. It was pretty cool to see it for the part it played in the history of our country. Back home, I have run the usual routes, but since I had missed the PDR, I decided to run part of the 2nd half of the Philly Marathon route. I did see that they have started to advertise for the Marathon, on their tour buses! All this leads me to the run I had the most fun doing this year so far! 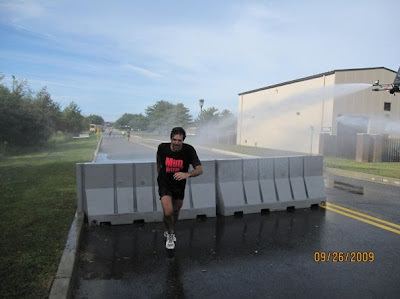 I did the McGuireAFB 10k Mud Run. Picture part running, part basic training/survivor obstacle course. There were about 20 of us from the trail group, that made the trek to McGuire, and did the race. There were some hard parts to this event. It started with about a 3/4 mile run, when at about the 1/2mile mark, a ladder fire truck hosed you down. 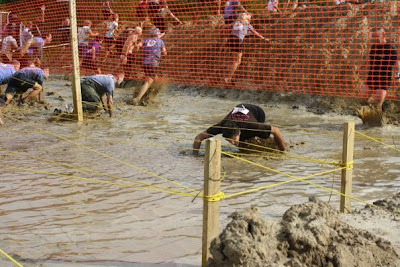 If that didn't soak you, going into the mud pit obstacle around the bend got ya! At one point I was waist deep in a creek, for a few hundred yards, and when you got out, the legs were so cold, it was tough to get them warmed up and going again. What they called "hurdles", where more like a steeplechase. It was a crazy 1/4 mile of hopping barricades every 100 yards. It was insane but fun. A lot of groups dressed up for this race, guy dressed as Elvis, one dressed as a chicken, just craziness! This race was a nice distraction in the middle of my marathon training. Last year it was in Nov, and I am glad they moved it up a few months. A few of the trail group that did it last year, said the improvements to the course this year, made it more difficult, but it was a lot warmer. I couldn't imagine wading waist deep in water, in Nov ! Here are a few pics of the fun! 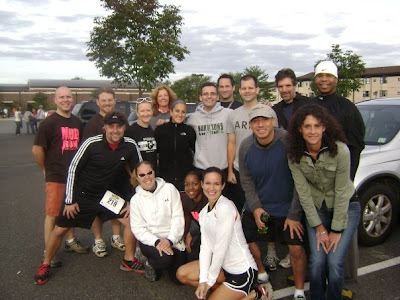 The last shot is a few of us after we attempted to clean off the mud from the race. If you live close to McGuire AFB, keep an eye out for this event next year... it's a must run! Be prepared to get wet and dirty... there's no way you don't stay clean and dry! I have a nice recovery week on tap, and a 20 miler next Sunday. Hard to believe September is coming to a close, and Philly is only 54 days away! 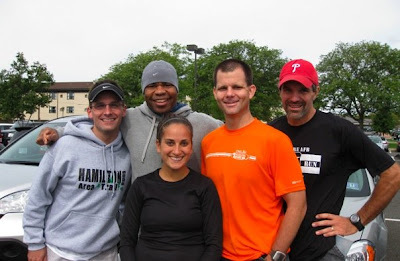 I need to start thinking about the Asbury Park Marathon, that I am running on Oct. 18th. I know it's just for training only, but it's still a marathon! 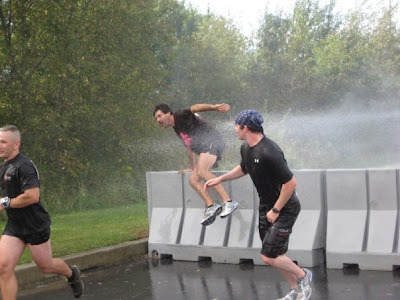 Man, that mud run sounds like a blast, and a great workout! Great stuff! That muddy run does look like fun! Sorry you missed PDR, we had a beautiful running day. Two marries within the space of a month and a half? Have your brainpan checked, brother! I added your name to my post today - sorry for the oversight! What a fun looking race. I've been finding a lot of similar races lately and itching to run one. But living in the city means that most of them are far away. Boo. I WAS part of team One Hot Mess for the AFB Mud Run, but had to back out cuz of work :( Looks like I missed a fantastic time! I was in Dallas on the 30 and in Fort Worth now. I got a couple of runs in. I've always wanted to do a mud run, but the best one out here sells out in a matter of hours. Another week is in the books! Only 75 days until Philly !